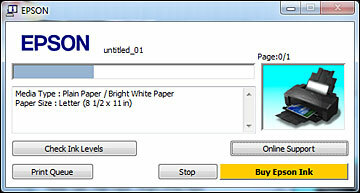 During printing, you see this window showing the progress of your print job. It allows you to control printing and check ink cartridge status. To cancel printing, click Stop. To see print jobs lined up for printing, click Print Queue. To check ink status, click Check Ink Levels.